Do You Want To Be A Busy Engineer? It’s simple actually… You have to start by gaining someone’s trust! If you decide that you want to record your cousin’s rock band, then make sure that you do it as if you were getting paid the “big bucks” for it… even if you are doing it for free. When people see that you are committed, they tend to trust you. They will not only trust you to do their project when there’s money in the budget to pay you, but they will tell their friends about the great job you do. Just be sure not to build your reputation on your price.. build it on your quality and your consistency. The funny thing about trust is You can’t demand it, it has to be earned! If you think about it this way… every working relationship you have was built on some level of trust. No matter where you are in the food chain, people above you (people that you work for ) have to trust you. Being a busy recording engineer, producer, etc. is no different. You just have to treat what you are doing with the same amount of commitment. A great way to gain trust as an engineer is by showing people the quality of your work. A great “Mix Reel” will go a long way in showing people that they can trust you with their music, though it can be difficult as a new mixer to showcase your work if the songs you have been mixing are not well recorded. 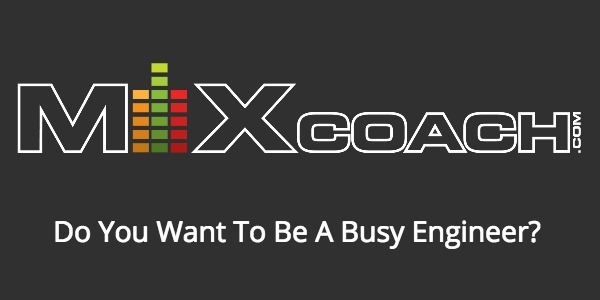 As a member of MixCoach Pro Member you can grow your mixing skills with great songs and well recorded tracks every single month, while gaining experioence mixing a wide variety of styles and genres of music. If you are interested, head over to MixCoach.com/free for a look at what you can expect, and some really great FREE content.